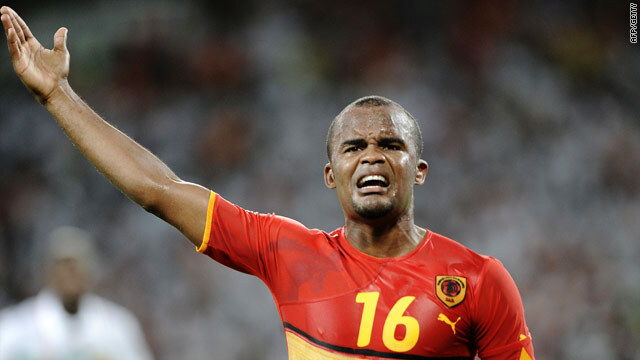 Flavio celebrates his second goal for Angola before the remarkable Mali fight back. (CNN) -- Hosts Angola were denied victory by an incredible Mali comeback to force a 4-4 draw in the opening match of the troubled Africa Cup of Nations in Luanda on Sunday. Angola appeared headed for an emphatic victory when they led 4-0 with only 16 minutes remaining before Mali produced one of the most remarkable recoveries in the history of the competitive football. Barcelona's Seydou Keita with a double, a brilliant Frederic Kanoute header and finally, deep into injury time, the equalizer from substitute Mustapha Yatabare completed the great escape. The dramatic match went ahead against the tragic backdrop of the murderous machine gun attack on the Togo team bus in Cabinda on Friday, which left two dead and several injured. Angolan president Jose Eduardo dos Santos issued a rallying call in his speech to mark the official opening of the competition, which was attended by several heads of state, including South Africa's Jakob Zuma whose country hosts the World Cup finals later this year. "Despite the terrorist attack, Cabinda will remain a hosting city," he said. "There is no need to be afraid." After the speeches and fireworks, Angola proceeded to do their country proud with a dominant first half perfomance against a desperately disappointing Mali side, who were one of the pre-tournament favorites. Flavio Armado put them two ahead by the break with headed goals in the 36th and 42nd minutes. Mali pressed hard at the start of the second half with their captain Mahamadou Diarra denied by a point-blank save, but their efforts were undermined when they conceded a 65th minute penalty which Gilberto converted at the second attempt. Gilberto was then brought down by Keita to concede another soft penalty and Manucho slotted home the fourth to send the home fans in the 11th of November stadium wild with delight. Their appeared little danger when Keita scrambled the ball home in the 79th minute from a corner and alarm bells were still to ring when Sevilla striker Kanoute at last showed his quality with an 88th-minute second goal. But Keita struck a third on the stroke of nomal time and with Angola's defense in total disarray it was left to Yatabare to make a name for himself with the leveler.